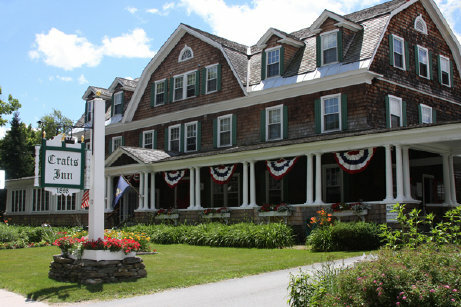 For over 100 years, the Crafts Inn has been a delightful destination in the heart of Vermont. Featuring a great location, pool, sauna, and historic architecture, we would be thrilled to welcome you as our guest. For over 100 years, the Crafts Inn has been a delightful destination in the heart of Vermont. Featuring a great location, pool and sauna, and historic architecture, we would be thrilled to welcome you as our guest. The inn is central to a lot of places, so we did day trips and saw so much of Vermont. Everyone was so friendly and helpful. The pool and hot tub were very nice. I definitely would recommend this Inn. The Crafts Inn, along with Memorial Hall (which is next door), were designed by architects, Mead, McKim & White, with the New York firm of Stanford White. White was considered one of the preeminent architects of his time. The architectural designing of the Inn and Hall was started in 1898, Memorial Hall was opened mid December 1902 in time to have Christmas celebrations for the town, and Craft's Inn was opened on February 10, 1903 by Major F. W. Childs and was called "Childs Tavern" at that time. The hotel was built more as a resort for visitors who would be staying for an extended period, as opposed to other accommodations in the area, designed largely for travelers passing through. A lot of people would come up from the city. The men would send their families up for a long-term stay, maybe for a month during the summer. It was a very popular place back then. The Crafts, one of the town's founding families according to local historians, had come into the hotel business through what is now the Vermont House (which still resides across the street from Crafts Inn). May Allen acquired the Vermont House from her brothers and later married into the Crafts family. According to Floyd Crafts, the hotel business experienced a boom at that time and the family contemplated how they could capitalize on it, when Mr. Childs made his proposal to the Crafts. A year after it was deeded to the Crafts by Childs, the Tavern was expanded. The addition in 1912 contained twelve baths (which was a luxury back then), one between each two rooms, and soon after sixteen additional rooms had been so equipped. All rooms then having hot and cold running water. The lobby was later enlarged to accommodate the guest comfortably. The Inn changed hands several times beginning in the 1950's with the introduction of skiing at Mount Snow, but these budding entrepreneurs failed for one reason or another. It was during the 50's that the business name was changed to reflect the first proprietors, the Crafts, thus changing from Child's Tavern to Craft's Inn. Floyd and May Craft had run the business since its beginning, and owned the operation for almost 20 years.